Here are the ratings for the Secret Millionaire TV series, the program that sends real millionaires undercover in depressed areas. Their goal is to find deserving people so they can give them a little financial helping hand. The third season of Secret Millionaire typically airs Sunday nights on the ABC network. These are the TV show’s ratings for the third season, the best way to tell if Secret Millionaire is going to be cancelled or renewed for season four. Final season averages: 1.2 rating in the 18-49 demographic with 4.81 million total viewers. Season averages: 1.18 in the demo with 4.81 million. 0.8 in the demo (-20% change) with 3.91 million (-8% change). Season averages: 1.19 in the demo with 4.84 million. 1.0 in the demo (-17% change) with 4.23 million (-15% change). Season averages: 1.23 in the demo with 4.92 million. 1.2 in the demo (+9% change) with 4.86 million (+3% change). Season averages: 1.25 in the demo with 4.99 million. 1.1 in the demo (-8% change) with 4.71 million (-9% change). Season averages: 1.26 in the demo with 5.00 million. 1.2 in the demo (+20% episode-to-episode change) with 5.15 million. Season averages: 1.27 in the demo with 5.04 million. 1.0 in the demo (+25% episode-to-episode change) with 3.97 million. Season averages: 1.29 in the demo with 5.03 million. 0.8 in the demo (-47% episode-to-episode change) with 3.80 million. Season averages: 1.33 in the demo with 5.20 million. 1.5 in the demo (0% episode-to-episode change) with 5.69 million. Season averages: 1.44 in the demo with 5.48 million. 1.5 in the demo (+25% change) with 5.66 million. Season averages: 1.43 in the demo with 5.43 million. 1.2 in the demo (-20% change) with 5.04 million. Season averages: 1.40 in the demo with 5.35 million. 1.5 in the demo (0% episode-to-episode change) with 5.36 million. Season average: 1.50 in the demo with 5.51 million. 1.5 rating in the 18-49 demographic with 5.66 million total viewers. Season average: 1.50 in the demo with 5.66 million. Compared to the second season opener, Secret Millionaire was down by 56% in the demo (vs a 3.4 rating) and down by 56% in viewers (vs 12.67 million). ABC says however that the third season opener was the network’s most-watched program in that timeslot since July 2008. Time will tell if they’re happy enough to renew the series. Reference point: The six episodes of season two averaged a 2.8 demo rating with 10.7 million total viewers. What do you think? 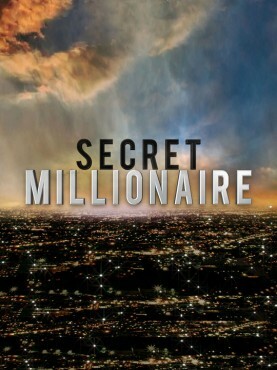 Do you like the Secret Millionaire TV series? Do you think it should be cancelled or renewed for a fourth season? I am amazed that this program does not have better ratings. I find it personally inspirational and EVERY WEEK I DO FALL IN LOVE WITH BOTH THE MILLIONAIRE AND THE PEOPLE WHO ARE IN NEED OF HELP IN ORDER TO FULFILL A DREAM. I think our society needs to be reminded that good people are out there . If you need help, I cannot give money but I eagerly will donate my time to see that this show continues. Just needs a little fix, how about helping grandparents that are bringing up there grandchildren with no…..help at all, they do not plan for this it just happens more often now and no one is there to help them there parents are likely dead.a lot of them do not even have enough income for there self. I’m one of those grand children and I have so much respect for all of them . enjoyed english version and then american version.maybe planned, but shows areal need .out there, and that there are people with real money that know where they have come from. they are willing to reach out and give a hand up. also gives exposure to real needs in our communities. please continue this wonderful program. Please renew Secret Millionaire and show the rest of the episodes. Renewed – This is one of the only show I watch every week. It shows hope in the midst of despair. I work at a non-profit in North Carolina. There are millions of people across the US who have to depend on charitable organizations just to survive. I think it is great that there are millionaires out there who want to give back and help support these worthy organizations. I Really do believe that more shows should be made like this…..please do not remove …. I LOVE Secret Millionaire. I cry at every show. There are so many people/places that try to help the ones that really need it and in fact they are the ones that need help the most staying in business. The millionaire’s have the money and most have a good heart and get something in return by helping.